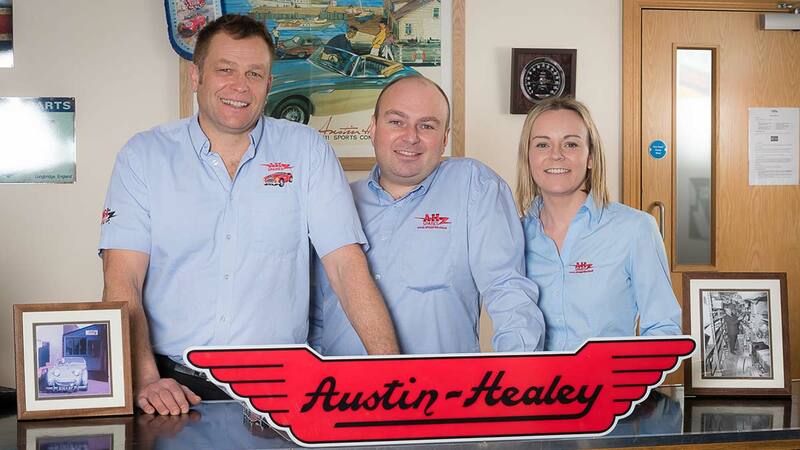 A.H. Spares Ltd is the original and largest supplier/manufacturer of Austin Healey parts in the world. The company was established back in 1972 by our founder, Fred Draper who had been the Parts Manager with the Donald Healey Motor Company. When the Healey factory's dealership was not renewed by BMC, Fred took his redundancy money and bought up all the spares. He then set up A.H Spares Ltd from his home and started to invest in tooling for the continuation of these parts. Once the company had established itself, Fred's nephew, Bob Hill joined the company along with Gordon Barton who had been Fred's assistant at Donald Healey's. After Fred retired Bob and Gordon continued developing and expanding the business, making A.H Spares the leader in their field. We are still a family business as Bob's son and daughter, Jonathan and Rebecca run the company along with John Lee our Sales Manager. The new team aim to build on the sound foundations already established. We pride ourselves in being able to offer our customers the ultimate in quality and authenticity when it comes to their Austin Healey needs. Our manufacturing processes are as original as we can possibly make them and we only source materials that do justice to the heritage and prestige of these magnificent motor cars. Our team are ready and waiting to assist with a fast and friendly service. We hold vast stocks so our order fill rates are unrivalled by any other Healey parts supplier. At A.H Spares we are a forward-thinking company with our roots firmly in the past and it is our aim to become the one-stop shop for all your Austin Healey requirements and to keep these splendid cars running for generation after generation. Many of you will know the history of this company, but for those who do not, it was started back in 1969 by Fred Draper, who as parts manager for the Donald Healey Motor Company Limited of Warwick (with whom he had been employed for 18 years) was instructed to compile lists of the 100/6 - 3000 model spares stocks with a view to selling them off as the earlier Riley Healey and 100/4 parts stocks had been. It was of course to provide space for the forthcoming Jensen Healey model but Fred knew that this news would cause great concern amongst current club members in particular and it was only a matter of days before he was approached by several committee members expressing their concern over the situation. About this time too, with production having ceased on all but the Sprite model, Fred was told that his staff had to be further reduced and his second in command, Gordon Barton would have to be made redundant. Fred suggested to the company however, that instead they make him redundant and allow him to purchase the remaining 100/6 – 3000 stock of parts with which he would then set up a small business with the sole aim of supplying parts for these models and so ensure the continuity of interest in the marque for the anticipated future developments. After much deliberation by the company, this was agreed to and Fred left their employ in February 1970, registering a business in the name of A.H Spares and intending to commence trading from the first day of March. Unfortunately the premises he had acquired, and where most of the stock was stored, were subject to a closure order by the local authority and he was not allowed to operate a business from there. In fact it took a 2 year legal battle and the necessity of an appeal to Whitehall (which proved successful) before A.H Spares were able to operate from Tachbrook Road in Leamington Spa. During this time however, business was conducted from his home with the assistance of his whole family and prospered mainly by word of mouth and a few lines in the Club newsletter stating that Fred could be reached on his home phone number (the number which was later taken to 427 Tachbrook Road for obvious reasons). 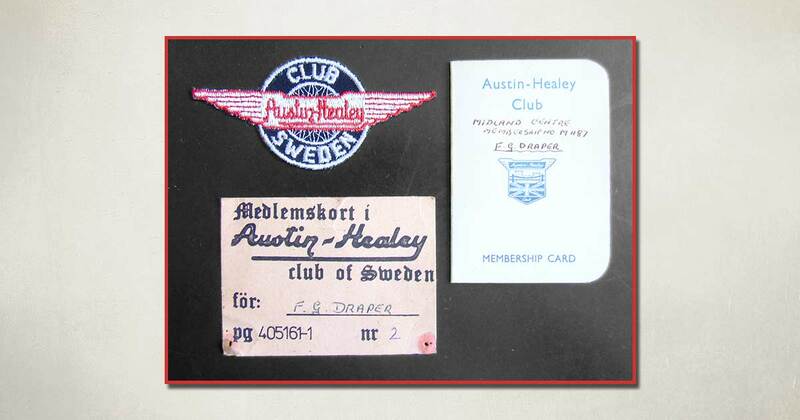 Fred Draper's original Austin Healey Club membership cards & badge. It was during these first two years that Fred was able to arrange for many parts to be re-produced for A.H Spares and so was the first in the market with reproduction panels. The Austin Healey Club also acknowledged his concern and assistance at this stage by honouring him as a life member and this was followed by the Swedish Austin Healey Club who honoured him with a membership badge of No. 2, (Donald Healey himself being No. 1). 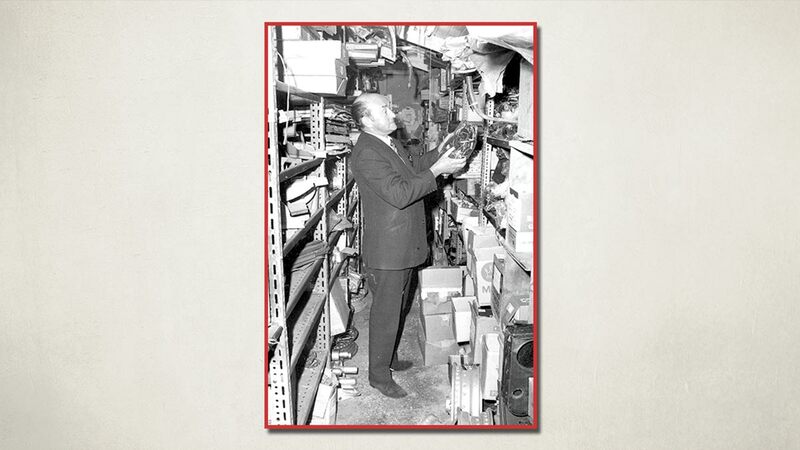 In early 1972 Fred invited Bob Hill, his nephew, to join him and a partnership was formed to co-incide with the opening of the business at Tachbrook Road. This proved to bring further success and growth and very soon the business was getting to be more than the two of them could manage and at this stage Gordon Barton (also ex. Donald Healey Motor Company Stores Staff) was invited to join them and he duly accepted. 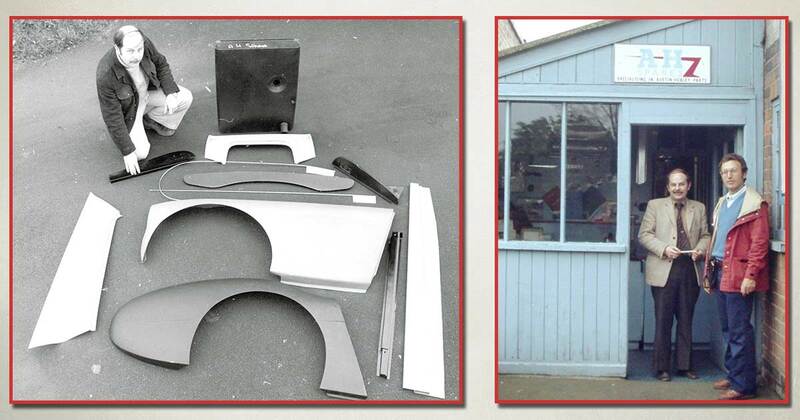 Left: Bob Hill with various Austin Healey spares | Right: Bob Hill with a customer. These three together with a little part time help built up a considerable worldwide mail order service as well as assisting all those who called at the premises and these have been owners from all around the globe. It was during this period too that the bold and costly decision was made to lay down tooling for wings and certain body panels to be pressed again as they were originally. These were in fact to replace the handmade panels which although they proved to be 85% successful, the partnership had never been really happy about. The panels which have been pressed since 1976 however, have proved to be 100% successful and are still the only pressed wings on the market, they have and still are being exported to every country where Austin Healey found a home. After the disappointing cease of production of the Jensen Healey, it was decided to invite Paul Moulder (Ex. Jensen Buyer) and registrar of the Jensen Owners Club to join the Company and in 1978 he accepted. Since that time A.H Spares have added Jensen Healey parts to their stocks. In early 1981 it was decided to form a limited company and a board of directors was constituted from the partnership. Plans were made to expand the business by moving to new and larger premises in the small market town of Southam and by continuing to primarily cater for Austin Healey and Jensen Healey requirements, remanufacturing parts which become obsolete or unobtainable where it is a viable proposition, for in this age of exceptionally high tooling costs, it often becomes an impossibility to reproduce a part for what is considered to be an acceptable price. The company now export to every country in the world where Austin Healeys and Jensen Healeys are to be found and apart from supplying to the respective clubs and private individuals, do in fact supply to many large trade outlets in Australia, South Africa and the U.S.A. as well as the continent of Europe. The quality of our products is thereby acknowledged by all.